The recent El Nino is cooling down as shown clearly in both sea surface temperatures and lower troposphere air temperatures. 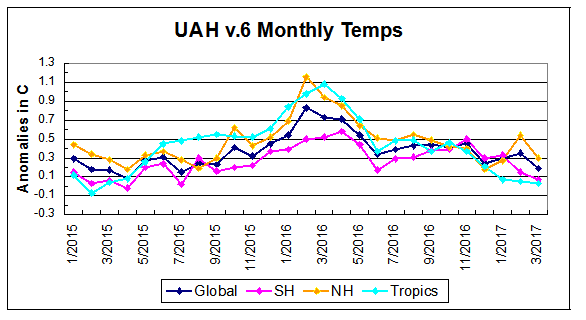 The two relevant data sets are UAH v.6 and HadSSTv3.1 now provide averages for the month of March 2017. The cooling pattern continues in the tropical seas while ocean temperatures in the Northern Hemisphere (NH) are flat. 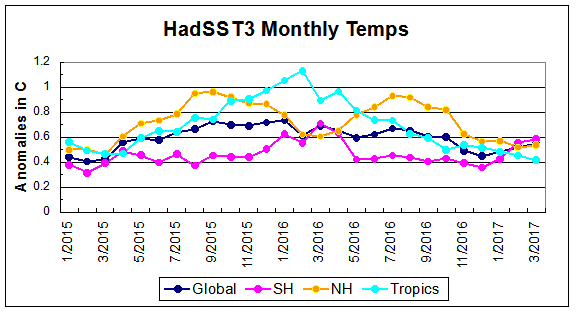 Southern Hemisphere (SH) oceans appear to be peaking and pulled the Global SST up a bit, but both are slightly below last March. Air temperatures in the lower troposphere tell much the same story. The greater volatility of air temperatures is evident, and we also see that the tropics (20N to 20S) and the NH (0 to 90N) are more closely aligned than are the comparable SSTs. The downward trajectory of air temps is clear after an upward blip in the NH in February.